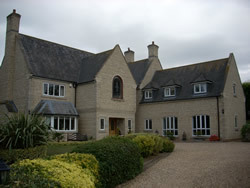 This large executive home was built by its owners in 1999 and one of the many focal points of this amazing luxury home is this very large bevelled glass arch supplied by the Leadbitter Glass Studio. 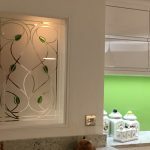 This large bevelled toughened glass panel measures 1350mm x 2100mm and contains 120 bevelled glass pieces. 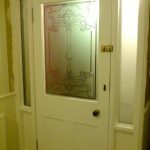 The bevelled border consists of 70 bevels alone and the arch at the top of the window was created by using 50mm square bevels each with a slight tilt to create the curve. 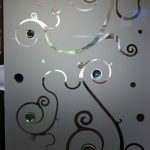 9mm natural lead (Option 1) was used for the border with 6mm natural lead being used for the large centre cluster. 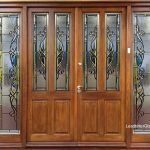 As you can see by the photo on the right the customer wanted the bevels to be on the inner pane of glass so the bevels are actually inside the home and what you can see in the photo is the back leaded part of the design. 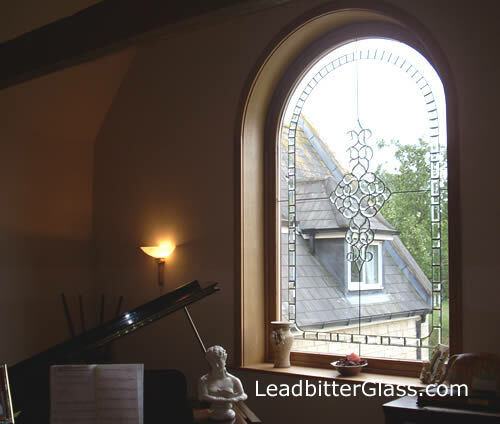 The photo at the bottom of this page shows how the glass looks from inside the home and at night time, when the hall light is on in the home, the bevels light up and create a beautiful feature window. 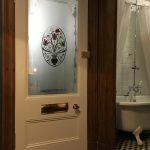 We went back to the home in 2010 to take these photos and because the decorative side of the glass was installed facing into the home, the leadwork still looks as shiny as the day it was installed 11 years earlier. 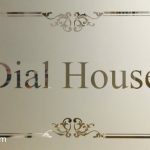 Natural lead tends to dull and change colour to a darker grey lead after the weather has deoxidised the lead. 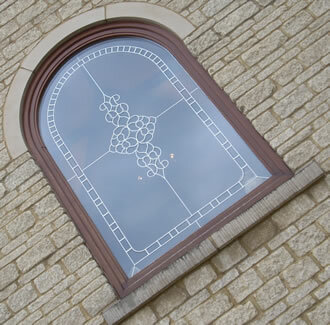 Leadbitter Glass can design and manufacture any sized feature windows in any of of our decorative glass techniques. 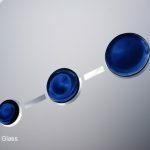 Once an order is placed with us, we can provide you with a ‘to scale’ CGI proof of your glass design in our Client Pages section before we get to work on the glass. 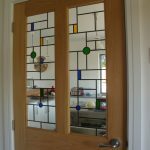 This is a great way of making sure that you – the customer is totally happy with your chosen design before delivery day arrives. 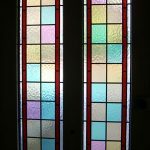 Our Client Pages service is unique to Leadbitter Glass and you can read more about it in our Glass Design Service section.